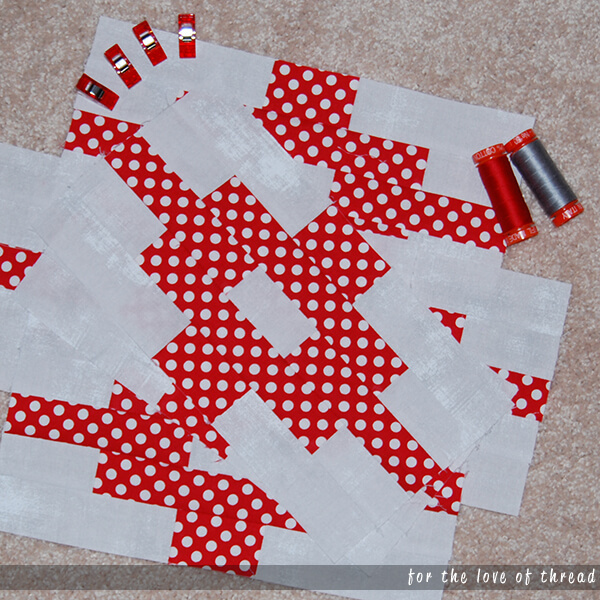 This came together quickly, and the red polka dot fabric reminds me of Minnie Mouse! 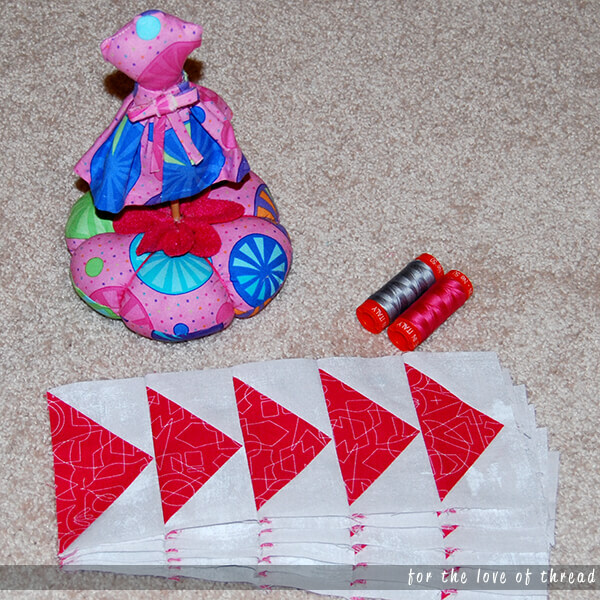 When I first started pulling fabric for this project, I started in my scrap bin thinking each block in the row would be a different pattern of red. My brain must have taken its Type A vitamins that morning because it just looked too messy when I laid them out. Like, I seriously couldn’t deal with it. Not only is the block pretty in pink, but so is this dress form pin cushion my daughter made me for Christmas last year! I can’t explain why, but I absolutely love flying geese blocks. I seem to have a really good system for getting perfect points, and I love how they tell your eyes which way to go. 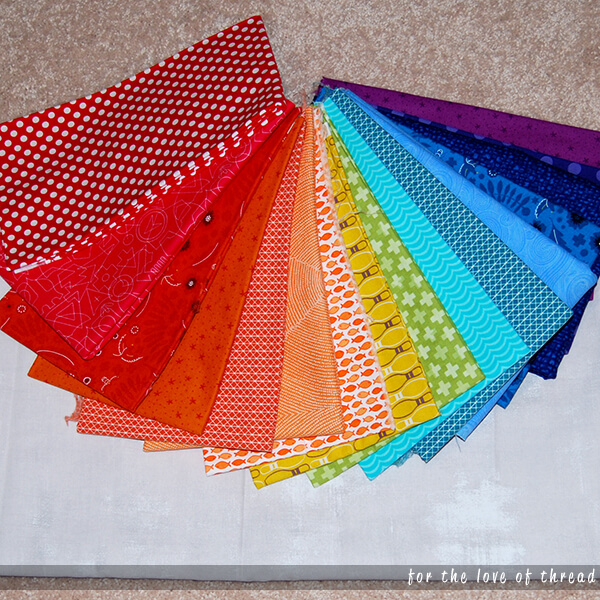 My gears are already spinning thinking about a quilt entirely in flying geese as a way to break out of my rainbow rut. Hmmm…. The simplicity of log cabin blocks pieced in a row is one of my favorite parts of this quilt. 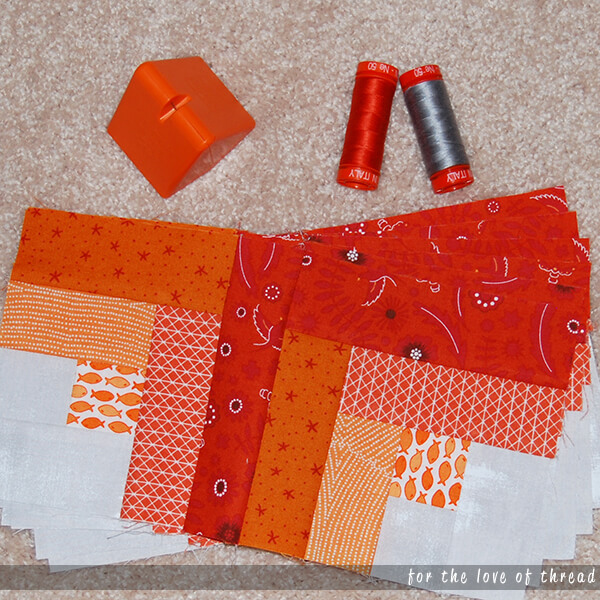 When I started pulling fabric out of my stash, I panicked a little bit thinking about the number of orange fabrics I’d need for the log cabin blocks. Apparently I made a real effort to build up my orange stash over the years because I was pleasantly surprised to see I could still make it work. 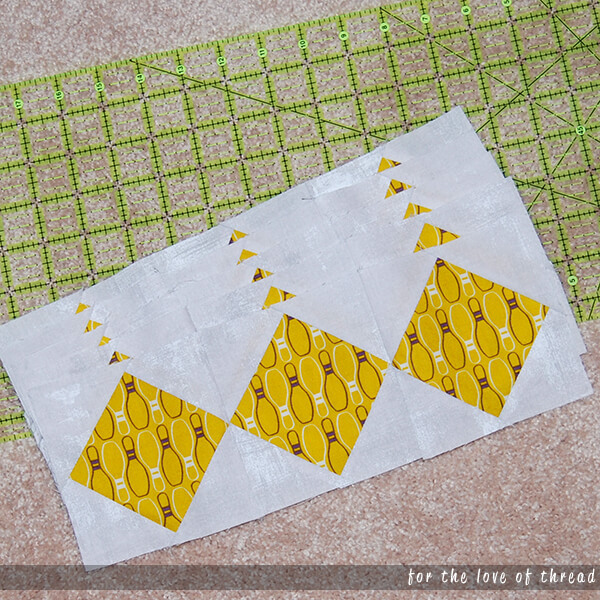 I couldn’t stop wondering what yellow notions I had while I was making this block… including the several minutes I spent using the ruler drawing my diagonal lines!! And finally, yellow! When I was pulling my fabric, I was so excited about being able to finally use my bowling pin fabric! It’s so stinking cute, I can’t stand it. So there you have it. Another project started. And now it’s time to check the inbox for April’s box. In related news, I don’t know that I have any yellow notions or tools to put in the picture! So send ideas over the next week or so. I’m gonna need them!